It was a pleasure to join you at the TPMA Southwest Foot & Ankle Conference in Frisco, TX September 25-26, 2015. The conference is an opportunity for podiatry professionals to build relationships with peers and discuss industry trends. Although networking is undoubtedly the most important aspect of a conference, You come to learn and gather new ideas. This could be a missed opportunity to meet face-to-face with the vendors who bring you new, innovative products and services. 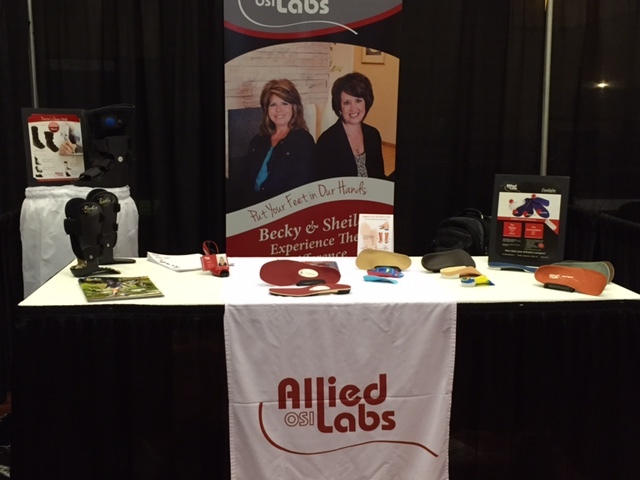 Allied OSI Labs is an industry leader in custom orthotics that featured the new SideKick Freestyle OTC orthotics at their booth. SideKicks Freestyles were designed with the same quality of Allied OSI Lab’s custom devices. These are manufactured in bulk, making it possible to keep prices competitive for doctors and, ultimately, their patients. The New SideKicks Freestyles are now available for purchase at just $19.95 a pair. You can save even more by purchasing the Freestyle Starter Kit which includes 20 of our most popular sizes and styles, as well as FREE samples to display at your practice! We look forward to seeing you again at the Podiatry Institute Windy City Conference, in Schaumburg, IL, where Dr. Richie will join us!